Wellscroft can order heavy duty deer or cattle grates as an alternative drive-through gate solution. Give us a call at 1-855-327-6336 for an estimate and to learn more. The standard cattle guard is 80 1/2" wide , about 12" deep and up to 22' long with 11 pipe rails to absolutely prevent livestock from crossing. Wellscroft carries 10,12,14,16,20 foot wide by 80 1/2" long. Available colors are Frey blue, hunter green, and black. The grill is solidly welded, braced and will not work loose with traffic. Made for easy handling and installation, all you need is a tractor front end loader and a couple loads of crusher run or dust. It is rated at 20 ton load limit if suspended on each side. Installed on a solid surface allows almost unlimited weight carrying capacity. We recommend installation on an existing road bed and building up the approach. To make it self-cleaning, divert the drainage water from one side of the road, beneath the cattle guard, to the other side, it will clean out the accumulated leaves, etc. Livestock cannot walk across it! 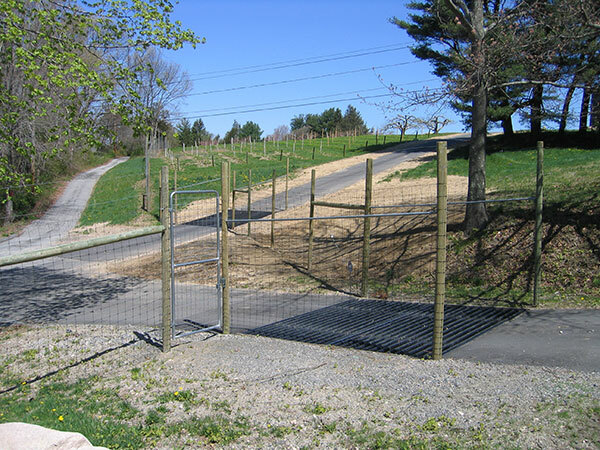 The Deer Guard is basically the same construction as the cattle guard, but with one modification, 13 pipe rails are used to prevent animal crossing. It is available in many lengths. It takes two sections to make one unit.